Hmmmm. I’m feeling rather bored with weekly connection requests in LinkedIn from people who are apparently a ‘professional podcast promoter’. They have all originated from Bangladesh, and the messages are all eerily similar. A few have addressed me as Sir! Doh! Anyway this trend / plague got me wondering. 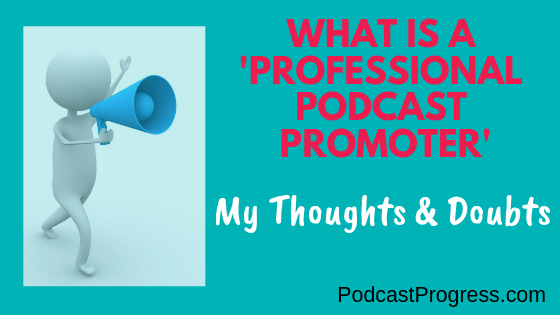 What is a professional podcast promoter and what, exactly, do they do? I have exchanged messages with some of them, asking them what they do. I have asked for examples, and for them to back up their claims. They just repeat the claims made in their connection request. I haven’t found any websites giving specific details. There are plenty of similar people in places like Fiverr, all saying the same sort of thing. There is a total lack of decent information about what they do, and what they achieve. Typically, they also include services such as App promotion too – providing 5 star reviews and downloads. That sort of thing. Which leads me to assume stuff. Podcast promotion, in this context, is another variation of buying likes and links, isn’t it? Only ‘cos it’s a podcast, then it’s downloads and reviews. Are there armies of people out there, who call themselves a professional podcast promoter, and who are being paid to download and like and leave reviews? I guess there must be. Why bother buying such services? So, there is the ‘supply’. Where does the ‘demand’ come from? Why would we want to indulge in doing this – buying links and downloads and reviews? Basically trying to ‘game the system’, and get the podcast or app or whatever it is, higher in search results and charts. Is that actually going to achieve anything for us? Or is it going to get our content penalised? We have seen many times over what happens when different ways of gaming the system are stopped by a few algorithm changes here and there. The wailing is heard worldwide. For our strategic podcast, the podcast we are using as a content generator and important lead generator, then of course, we want to build an audience of people who are genuinely interested in our content. We aim to get them into our marketing funnel, and ultimately that they buy our stuff, be it a service or a product. So we need to market our podcast, in different mediums, and in the different places where our ideal listener / client tend to go to for advice, education or entertainment. Nothing replaces consistent, targeted marketing of your podcast. And paying a bunch of people in Bangladesh (or anywhere) to download your podcast episodes, and leave false reviews, certainly isn’t going to grow your business. I personally find the whole thing highly suspicious and rather pointless. Of course, if you have had a great experience with these services, then I would love to hear from you. If you want to promote your podcast, and improve your podcast downloads, reviews, and lead generation for your business, why not take a different step and Contact Me? Let’s have a friendly chat! I will listen to your ideas, and problems, and suggest the best next steps for you. If you want to learn more about the unique way in which I work with you, then my Podcast Services page would be a good place to start. Update: 23Oct2018 today I came across this article published last week which is talking about a similar problem – buying clicks from what they describe as ‘click farms’.